The film tells about the hard work of surgeons of Bakulev Institute of Cardio - Vascular Surgery in Moscow. 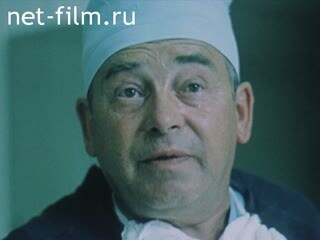 The film tells about the work of surgeons of the Moscow Institute of Cardiovascular Surgery named Bakuleva. The film includes recording: Part 1. Professor V.Aleksin-Miskhishvili and his team lperiruyut child in the operating room. V.Aleksin-Miskhishvili tells the morning konferetsii (sinhr.) 0 the results of this operation. Women with small children in their arms at the reception of surgeons. Nurses caring for sick children after surgeries on the heart. Doctors resuscitated patient in the ambulance. Cardiologist, Professor George and Professor Vladimir Iziman Workers talk (sinhr.). in the study. G.Tsukerman professor and his team operate on the patient. Man underwent surgery gives interviews (sinhr.). L.A.Bokeriya professor and his team operates patient. Professor V.Buharin operates a child with congenital heart disease, gives interviews. Director of the Moscow Institute of Cardiovascular Surgery named Bakuleva VI Burakovsky operates, gives interviews (sinhr.). Surgeons during a morning conference, working in a diagnostic study on computers between operations. Woman with boy operated on during discharge from the hospital. Medicine. Care for the population.